In all areas of your life, conflict is inevitable. The majority of us do not like conflict at all, yet it’s part of life. We are going to see things from different points of view than the people around us. We are going to have different ways to do what we want or need to do. There’re really only four kinds of conflict you can experience. There is the conflict of roles and responsibilities – what is to be done, whose role is it, who is responsible and accountable for getting it done. Do you ever wonder how to become more influential? The second is conflict of goals and needs. What is it we are trying to accomplish? What is the objective? What result do we desire to obtain? Third is the conflict of values and beliefs. It’s the things you value in your life, the things that are most important to you personally and professionally. And the fourth type of conflict is conflict of perceptions or point of view. Of these four types of conflict; roles and responsibilities, goals and needs, values and beliefs or perception and point of view, over 80% of all conflicts are conflicts of perception. Why? We are different people. We’re older, we’re younger. We’re male, we’re female. We’re more educated, less educated. We grew up in different sizes of families in different parts of the country and we went to different schools. We now have different sizes of families living in different parts of the country that attend different schools. We have different interests and hobbies, and like different types of foods. Shall I go on? We’re different. Managing conflict is one element in having great presence. Conflict is going to come your way. How you maintain your composure, your reactions, how you take care of yourself in the midst of the conflict, makes a giant impact on how people are going to respond to you and the type of presence they are going to see you as having. It’s true. Every day you need to be moving forward. You need to be proactive. You need to carry your presence in such a way that people around you are willing to move with you whether you are a lion or a gazelle. Are you a stumbler? Are you skillful? Are you a lion? Are you a gazelle? Are you an ok communicator or are you truly persuasive, influential and charismatic? These are skills we need to build to move us forward. 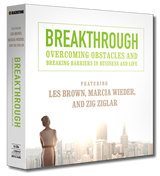 Overcoming Obstacles and Breaking Barriers in Business and Life. What if you could change the world? What is holding you back? Learn success techniques to break through your glass ceiling and achieve extraordinary results. This audio series will challenge and inspire you to go beyond your comfort zone, providing practical tips on how you can make changes. Get multiple points of view from bestselling authors on topics ranging from achieving goals to getting clarity on your true desires. Move past the fear that holds you back—whether it’s conscious or subconscious. Once you understand the process of Breakthrough, nothing can hold you back from achieving your dreams. Create your future now, and structure your life for a breakthrough success.